A love letter to the Soviet-born ballet dancer Rudolf Nureyev, who radically changed the perception of male dancers throughout his celebrated career. 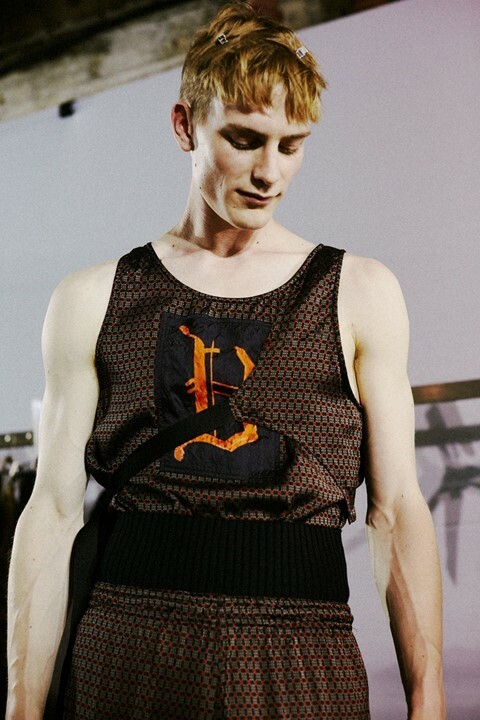 "I was thinking about a sensual man," Van Noten mused backstage. This season was very much an exercise in pushing the boundaries of the preconceived silhouettes of a man's body. There were scooped necks, which revealed the models’ clavicles – an erogenous zone often ignored in menswear – alongside unitards and knitted waistbands. Embroidered harnesses made their way across bare torsos whilst silk jackets fell off the shoulders. Van Noten is revered for his prints. His current sensory-laden exhibition at the Musée des Arts Décoratifs in Paris is a testament to his expansive references, from last season’s rave-Renaissance tie-dye to the rich patterns and paisleys of AW13 that clashed seventies carpets with William Morris. This season he worked with illustrator Richard Haines to create prints of naked men dancing across fabrics, a sure tribute to Nureyev as a figure of sensual, almost animalistic eroticism.